Nestled just 40 minutes north of Cabo San Lucas on the new 4-lane hwy 19, the villa overlooks one of the world’s most pristine beaches. 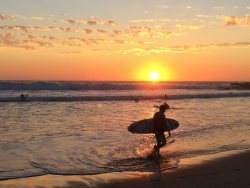 Stay at the “best beach in south baja sur.” with stunning views, scout out the surf from your private terraces or stay poolside.. Visit the galleries of the Pueblo Magico city of Todos Santos and enjoy the art, film, and music festivals held annually. Relax your mind and indulge your senses with a massage on the beach or in the privacy of your room. Learn to surf on the only beach with beginner, intermediate & advanced areas to catch some great waves. Horseback ride on the beach, take a yoga class or enjoy world class fishing including marlin, dorado, tuna, yellowtail, sierra, mackerel, sea bass and red snapper. Located on Cerritos Beach, on Baja California Sur’s only swimming beach. New Full palapa over the outdoor kitchen bar area! 2nd floor with balcony with hot tub right off of the master bedroom! · The only swimming beach in South Baja, is just a short walk away from your oasis. We are just a short 8-10 minute walk from beautiful Cerritos Beach, where you can swim, surf, relax, watch whales. There are 2 restaurants on the beach, and several new ones in the immediate area. We have several ocean and sunset watching decks, the third floor has comfortable deck loungers for soaking up the pacific sun. We have a great indoor / outdoor set up. 3 of them, one off the master, a second floor deck and a 3rd floor sunset watching deck and sun deck, with great views of the beach and mountains. World class golf is available in Los Cabos, about 45 minutes away.